11/7.14: Britain’s Kieran Whittle and Farai Bright Garamukanwa have taken the senior Men's Pair bronze at the 2014 World Championships in Levallios, Paris. 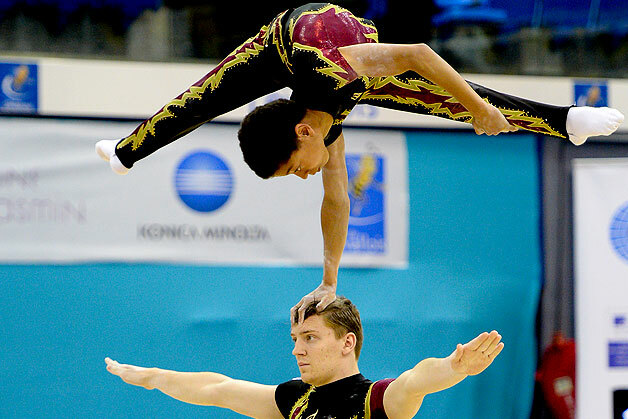 The boys were competing in their first major international and after qualifying in third position with their Balance, Dynamic and Combined routines they held their place and nerve in the final to take World bronze behind Russia and Belgium. It was a long wait for both Kieran and Farai who competed last out of the six finalists and the pressure was on as the scores went back to zero and one last Combined routine would count for everything. However their hard work and determination paid off as they took their place on the World podium. Watch the boys in action in their Dynamic qualifying routine. Elsewhere, Alice Upcott and Dominic Smith continued to shine in the Mixed Pair category with a stunning balance routine that had the audience transfixed. After completing two of their three qualification routines they sit in second with 57.835. GBR’s Women’s Group 1, Millie Spalding, Georgia Lancaster and Elise Matthews looked determined as they walked onto the competition floor. Their dynamic routine was almost flawless and adding that to their strong balance performance yesterday, they top the rankings with just their combined routine to go tomorrow (57.135). GBR’s second group of Cicely Irwin, Jennifer Bailey and Josie Russell threw some difficult skills for first year seniors and finished with 55.090 in 7th place. Unfortunately only one group per country can advanced to the finals even if they both finish in the top eight but all of the girls routines have been world class. Our Men’s Group of Daniel Cook, Connor Bartlett, George Wood and Gareth Wood put in an immaculate performance in their balance routine leaving yesterday’s mistake in their dynamic behind. They now sit in third with 56.080 even with that error and will look to close the margins on their rivals even more after tomorrow’s Combined routine. Great Britain is still looking strong for a team medal. The Men’s Group, Women’s Group 1 (Elise, Millie and Georgia) and Mixed Pair qualifying scores will all go towards GB’s total. The competition concludes tomorrow (12/7/14) with final qualifications and finals for the Men’s and Women’s Groups and Mixed Pairs.